In the last post, I showed y’all the progress we’ve made through our house – and some of the projects we did pre-blogging – since we bought our house five years ago this week. That was all downstairs stuff. You know, where company can see. Today we’re venturing up the stairs, to rooms I don’t show often because they’re so… not… done. Don’t look too closely, okay? There’s work to be done here! Okay! Onward to the upstairs! Also affectionately remembered as the once-poopy room. It works, it’s not terrible, but I don’t love it. I’m really itching to get some more pattern and interest in there. The wall color (Benjamin Moore Quiet Whisper, mixed at 50% strength) is soothing and calming for a guest room, so I’d like to keep it, but I’d love to change out the bedding for something a little more interesting. I’m thinking about upholstering the existing headboard too. We pretty much gutted it except for the tub. Y’all, I’m sure in this world there exists some way to take a decent photograph of a small room with no natural light, but I sure don’t know it. Maybe you can get the gist anyway? I like the room okay, but I’d like to do something different than the cabinet above the toilet, and I’d really love a grand, elaborate mirror over the sink, as soon as one falls into my lap for little to no money. That’ll probably happen soon, right? First, we painted it like 47 times. Approximately. Here’s a video of Andy confirming that number. 🙂 Then we built our bed, sewed some curtains, and here it sits. I still have SO MUCH to do in here! There’s a bare bulb hanging from the ceiling, the nightstands are broken and not functional, and there’s a whole empty sitting room off to the side waiting for some attention. Yeahhhh…. about the master bathroom. It’s our most neglected, most annoying, most debated (among us) room in our house. We removed a bunch of the stuff in the room when we bought it, then patched the sheetrock but never even painted it. It STILL looks like this. Imagine me cringing and hiding my face in embarrassment. It is SO BAD. The reason why we haven’t made any changes is that we are SO STUCK and can’t come up with a good solution to the floor plan to save our lives. Maybe you’ll have a brilliant suggestion for us? Here are the details. We’re saving up our pennies and hoping to give this room a COMPLETE overhaul in a few months. And welcomed our first home to this nursery, which I liked okay, but it was so dark and so brown. I was kinda itching to change things up a bit, so when number two came along and she was a lady-child, we brightened everything up a LOT. I made the curtains (here), added a pinwheel wall and the art above the crib, made the crib skirt and painted. Here are all the details on her nursery, which we changed over for under $500, including all the furniture. This room is staying exactly like this forever, because Mila is going to stay small and lovable and sweet for all times and never get sassy and less cuddly, ever. End of discussion. I blogged about this whole process, and this room has gotten its moment in the sun, so I won’t blab on about it too much. Can’t let it go to its head, you know. If I was a smart blogger, I’d end with a room that’s been finished and doesn’t look like this, with an actual sheet hanging over one of the windows. But at least you know we have so many more projects that need to be done, right?! Poor Weston. His room is so sad. I can’t wait to make it over and I have a few ideas brewing. It’s a BIG space so I’ve been hung up on deciding how we’ll use it, and wanting to design it to function well before I worry about making it pretty. That’s how I’m justifying the forever-long delay. It’s so fun to look back at how things have changed! I want to tell you in the next post about some of our lessons learned – what we’d do differently, what went well, what we wish we could tell our five-years-younger selves. Does it take you foreeeeever to get projects done in your home too? Do you have “secret rooms” that you don’t let the company go into? Spill it! Can’t wait to see all your upcoming changes. Love these types of posts. There’s always more to be done for me too! Every time I see your bedroom I’m reinvigorated to update our headboard with some upholstery. Hope you have a great weekend, friend! you have made so much wonderful progress that i know you will continue to…. look forward to it! Sometimes I tell people the downstairs bathroom is broken and they need to go upstairs…. I’ve justified in my brain that having a broken toilet for 2 years is better then admitting the truth- that it’s half finished and looks like heck because I’m afraid of my jigsaw and it’s still in the box. Gonna have to use that #decoratingtrumpcard hashtag a bit more. Let’s start a campaign. THANK YOU SO MUCH for posting this little series. It is so encouraging to me to see that you have done so many beautiful things with your home, but that there are some things that just haven’t been gotten around to, even after 5 years, makes tackling my home so much less intimidating. I don’t have to get it all done right now and that’s okay. Thank you so much for that. Well celebrate the finished spaces because they look amazing! We never finished a complete room in the old house and sold it, so never will. 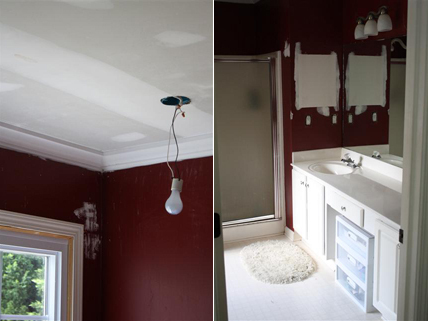 Also we didn’t paint over patches in the master bath until we listed the house. LOL it’s so easy to neglect that room. No one (but the blog world when you are forced to admit it) sees it. If you want to see a so-not-done room I will introduce you to our guest bathroom (which we ripped down to the studs due to a massive water leak, and it’s been that way for 2 years), my half-painted laundry room, or the 4th bedroom which we generally refer to as “the dog room” (it houses dog kennels and my husband’s clothes). Have you ever considered switching Weston’s room with the guest room? Then his current room could be sort of a combined playroom/guest room/upstairs living room. I also wonder if it’s possible to reroute the pipes for the shower head and make the wall between the tub and shower glass? It might give you a few more inches and make the shower less elbow-smashy (that’s a technical term, patent pending). Ditto the idea of switching rooms. Our bonus room is 1/2 playroom, 1/2 guest room and it works great! I love Milas room and the laundry room, of course, but I love your master bathroom even more. It makes me so happy…please don’t ever change it. Unless you want to stencil the entire thing, hahaha…payback. It all looks so lovely. I envy your wit, humor, and style. To be fair, you started out with a pretty nice, spacious, well-built house. Sure, it needed some love, but mostly cosmetic. Great foresight! I can’t wait to see the remainder of your evolution. Yes, you’re right – having great bones to start with makes a big difference! Thank you! I love slate too. Isn’t it funny how there ALWAYS more projects to do. Especially can’t wait to see how you transform that master bath!! All your home updates look great. Love the laundry room! I have so many rooms that are blah! Our master bathroom shower is still sitting with the backerboard and no tile up yet. The changes you’ve made to your home are gorgeous Kelly!! I love the nursery the 2nd time around, so bright and airy!! Please come to Arkansas and decorate my house!!! I LOVE your style and the colors and I LOVE all your drapes =) it is all so pretty. I’m impressed with all you have done to the house. For the mirror you are wanting, you might look at yard sales for an old dresser that has a huge mirror attached. I have one in our dining room that is rather large, that came from my parents dresser they purchased when they were first married in the early 1950s. It has a beveled edge and was attached to the dresser. I never cared for the dark wood of the dresser but always loved the mirror. So when it was offered to me I jumped at it and it has hung in our home from the day it came home with me. My secret room is my “home office,” formerly our spare bedroom. When mother moved out of her house I brought boxes of what I thought was “important papers.” That was about 2 years ago and I still haven’t gone through everything so the boxes are still stacked around the room. I would faint if anyone else saw that room. I’m so glad Lauren shared your blog with me. I love following it. I had no idea you were doing all this when we were going to church together. Oh man! All of our bathrooms are hideous!!! I mean carpet and oak cabinetry. Pretty much every room in my house is not complete. All the light fixtures need to be replaced. It’s a constant work in progress and the only room that is finished is the nursery and living room. However I am already thinkin of my girls future big girl room!!! Amazing work in 5 years!! So much more that what I have done in 4! And I love thinking of God the designer! He did awesome work on our granite countertops! Amazing, Amazing & More Amazing! And I’m with you on photographing small spaces- I’ve had to stand in the shower before! Your house is lovely! Even when it’s not-so-done. I especially LOVE your laundry room. We have been in our house for a little over a year and I also feel like the projects will never end, no matter how long we work. My secret rooms are one of our spare bedrooms that is the “craft room.” But in reality it’s the catch-all room so that the other rooms in the house can look presentable. So no one gets to go in there except me (even hubby rarely goes in there). I also don’t let anyone into the downstairs “bedroom” because it’s totally gutted from previous owners and it still has those sweeeeet sparkly ceilings. I’m really itching to get a move-on in that room. HA! First off, I totally saw that Princess Bride reference in the 3rd paragraph…I’m such a nerd! Second, my WHOLE HOUSE is a secret room. Seriously. I had grand plans when we moved in a year ago, and all I’ve done is paint the powder room downstairs, which is an impressive 4.5 x 9 foot space. We all have dirty secret rooms, no matter how small they are. So, never doubt again…because there will never be a need. Ahem. Ohhh this post is filled with goodness. Goodness and sweater vests. Love it!! 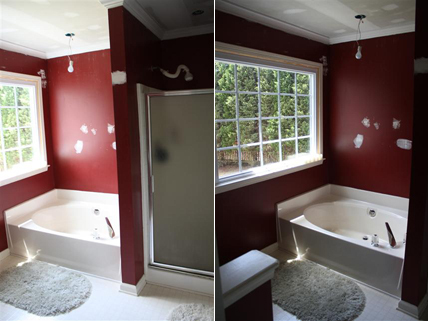 Our master bath is in a big need of a makeover just like yours. I have to say that you have a huge head start on your project in that all your floor tile is totally workable. I can’t wait to see you get started on this project. One thing that stands out to me in all your designs, which ROCK, are your curtain selections. They are just so perfect, each and every one (ok, maybe not the sheet, but the rest :)). I love your picks in patterns and how they just make the rooms really come alive. Love your style and your designs. WOW!!! I love Mila’s nursery (also, I totally JUST REALIZED that Mila’s name is like the girl version of Milo’s. Crazy! Well, I mean, except it’s Mee-la, right? So it’s like the girl version of the Italian pronunciation of Milo. anyway. I love her nursery). I’m glad I’m not the only one too intimidated to touch my master bathroom. At least yours doesn’t have nasty carpet in it! OMG, I don’t know why, but I’m head-over-heels in love with the vanity in your bathroom! I don’t know why – something about it. Can you share where it’s from?! I love these posts! It makes me wish my husband and I were ready to buy a house right NOW! Lol. You are doing a fantastic job, and trust me, even when it’s done, it will never be done. You can blog till your are 100. You’ve done an amazing job…inspires me, but I don’t seem to have the knack it takes for DIY…your upstairs master reminds me of my house! same linoleum in my bathrooms!…I love everything you’ve done and you should design for a living! You guys have accomplished a lot in five years! You should be proud. I think my favorite is Mila’s nursery; so sweet! Your daughter’s nursery is so beautiful! Where did you get the fabric for the curtains? Annnnd…I’m caught up on my View Along the Way reading! Finally! Sorry I’ve been MIA lately. Figuring out this whole blog-life balance has been tricky…. And I hope I haven’t lost my status as your bestie as a result. I at least owe you a Starbucks when I see you in a few weeks! EEK! You house is beautiful! Where did you find those curtains in the nursery? They are so lovely! That light bulb hanging out of the ceiling made me gut laugh really hard. I think for only 5 years you guys are doing great! I can’t wait to see more. The pinwheels all look so cute! I really like the bright nursery better than it’s brown incarnation. The latter looks kind of depressing in my opinion. Seriously, I can’t believe how much you’ve done in the past few years (in addition to having two babes!) Your home and your style are gorgeous, and I just adore all your creativity and willingness to do it yourselves. You two are so inspiring!!! Hi! Love your blog. Your house is gorgeous and your creativity is endless. Just a word of photography advice (since you asked). The best way to photograph a small room is with a wide angle lense. My advice is to put you camera on a tripod, turn off the flash (causing some serious shadows in your bathroom photos) and set it for a long exposure – longer exposure will let in more light so you won’t need the flash. Another thing you should do so the photo is not blurry is to either get a remote shutter release or turn on your timer so you can press the button and the camera has time to stop moving before the lens opens. Hope this helps!! I just have to throw this out there, I am a faithful blog stalker 😉 and it is such a breath of fresh air that you posted those pictures! Its easy to get caught up in what other people have and have done but we all have things that keep us going on and on. It makes you sit back and put time in perspective! I love your house and how much time you have spent making it a home 🙂 Keep on keepin on and I will def. keep reading! You are so brave to show the unfinished rooms, my friend! But your upstairs is so lovely too! Okay, not the master bath — but at least you have a roomy one to start with! Please tell me where u got your slate blue shower curtain!!! I have been trying to find one for a long time. Thanks. PS. Great job on your dyi projects! Awesome! Thanks! We got it a long time ago, I think from Homegoods. Love your blog. Im def. taking some ideas (painting my vinyl bathroom floor and painting my bathroom cabinets). Our house needs far more work than yours and i have 3 kids under 5 and we only make $150 a week…… so, I thought I would share a money saving tip. Mistints!!!! Go to Sherwin Williams and ask to see the mistints. You canget great paint for $3 a gallon or even free if you go close to closing time.